This is an "MgO matte". High MgO content is a common matting mechanism at cone 10 but also works at cone 6. This recipe has the same chemistry as G2934, however it sources the MgO from a frit and talc rather than from dolomite. The frit has a predictable chemistry, produces a much lower LOI (3.8 vs. 13.6), a smoother fired surface and better melt fluidity to host stains (stains look fantastic in this base). WARNING: Like the original, the degree-of-matteness is very dependent on cooling rate. Fast cooling (e.g. free-fall in a lightly-loaded or smaller kiln) produces a silky matte surface. Slower cooling (e.g. a heavily loaded kiln) produces a matter and drier surface (subject to cutlery marking). Test in your circumstances to decide whether to adjust your firing to accommodate this or blend in some glossy G2926B produce the silky surface. Fusion Frit F-69 can be used instead of Ferro Frit 3249 (actually, it is better). This recipe employs a mix of calcined and raw kaolin to keep the drying shrinkage down (to avoid cracking on drying). If you use pure kaolin it will likely crack during drying. If you do not have calcined kaolin just make your own (bisque fire a container of powder). This glaze has a very low thermal expansion and will not craze an any common clay body. It accepts stains exceptionally well. We recommend doing cutlery marking tests on your ware. If they mark, blend in a little transparent glossy glaze (like G2926B). This will compromise the matteness a little but will reduce the marking. 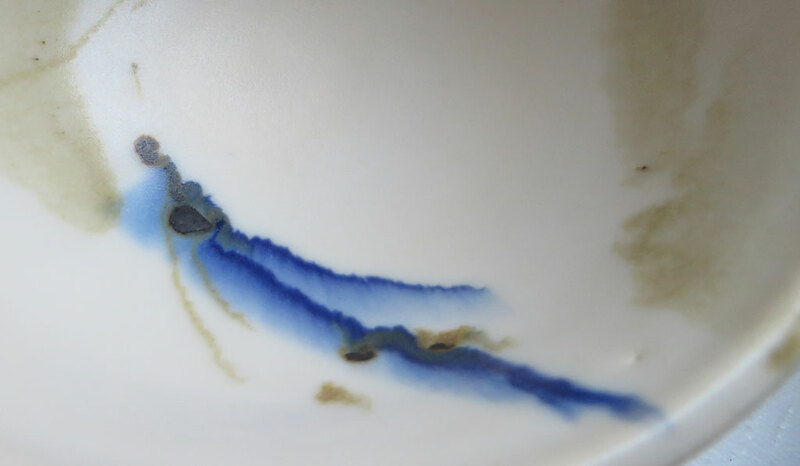 Again, although matte in appearance, this glaze has a high melt fluidity. That means that brush-on colors could bleed. 1100 water, 1000 powder to get creamy mix. Regular 2934 (with dolomite) took more water, about 1300. Nicer surface than G2934, same matteness, better fluidity. Slab-built. G2934Y base glaze recipe with 8% Cerdec encapsulated orange stain added. Cone 6. By Tony Hansen. This is the G2934Y matte base recipe with only 8% Cerdec Orange encapsulated stain. G2934Y employs a frit-source for the MgO (as opposed to G2934 which sources the MgO from dolomite). 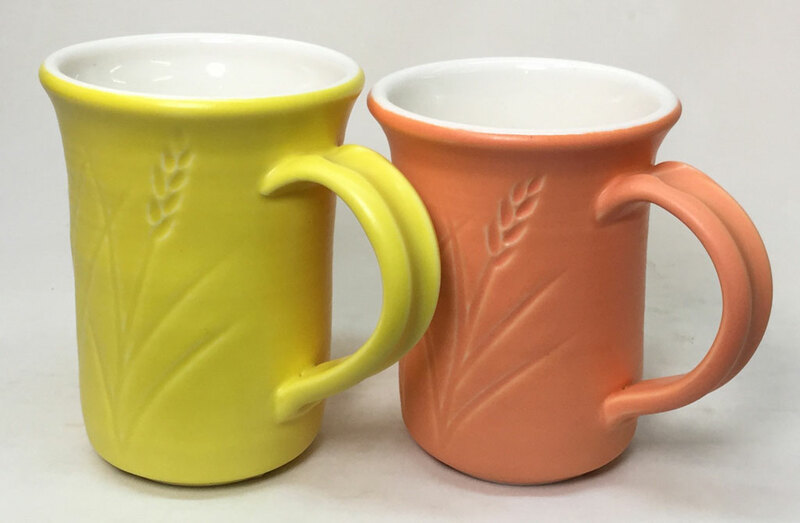 The orange color is brighter on the mug on the left because the porcelain is whiter, Plainsman Polar Ice (the other one is #6 Tile Kaolin based, P300). If this was a glossy glaze the required percentage of stain would be higher. Other colors, like yellow, are equally vibrant. But not all, testing is needed. They have the same chemistry, but Y, on the right, sources MgO from a frit rather than from dolomite. Y is has a more fluid melt so it is not as opaque against the black slip underneath (thus it looks better on translucent porcelains). However its surface is just slightly finer. The Y one appears darker on the porcelain tile but it is actually brighter. The Y version is more likely to fire to a functional matte because it employs a frit to source the MgO (instead of dolomite which is variable from region to region). Matte glaze cutlery marks. Add 10% glossy glaze to it. No marking. This is G2934Y (a version of the G2934 cone 6 matte base recipe that supplies much of the MgO from a frit instead of dolomite). Like the original, it has a beautiful fine silky matte surface and feels like it would not cutlery mark. But, as you can see on the left, it does! The marks can be cleaned off easily. But still, this is not ideal. The degree of matteness that a glaze has is a product of its chemistry. But can we fix this without doing any chemistry? Yes. By blending this with G2926B clear glossy (90:10 proportions) the marks are gone and the surface is only slightly changed. Matte cone 6 glazes have identical chemistry but one melts more. Why? 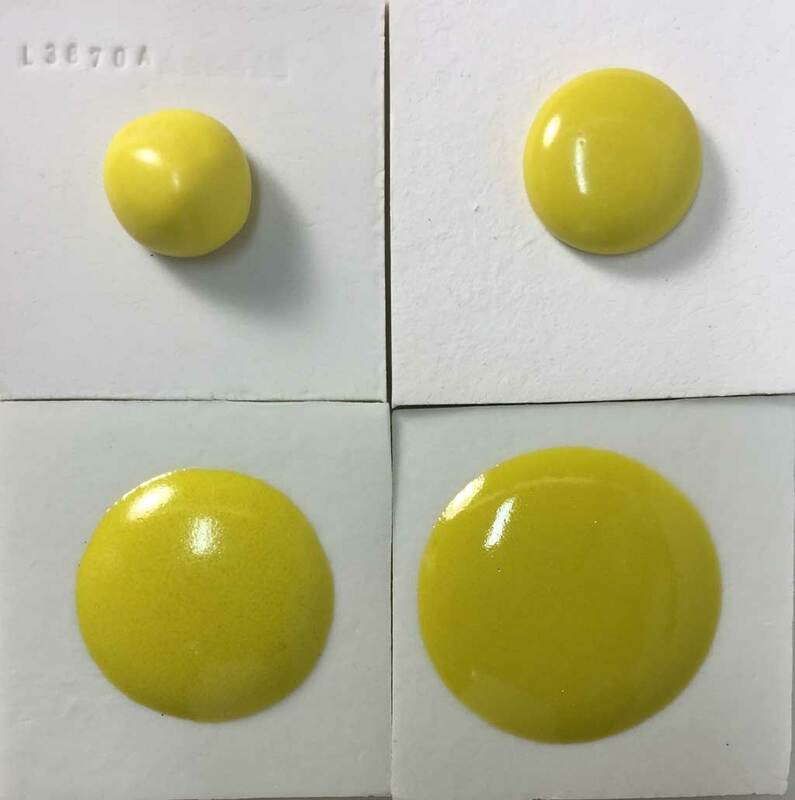 These are 10 gram GBMF test balls that we melted on porcelain tiles at cone 4 (top two) and cone 6 (bottom two). 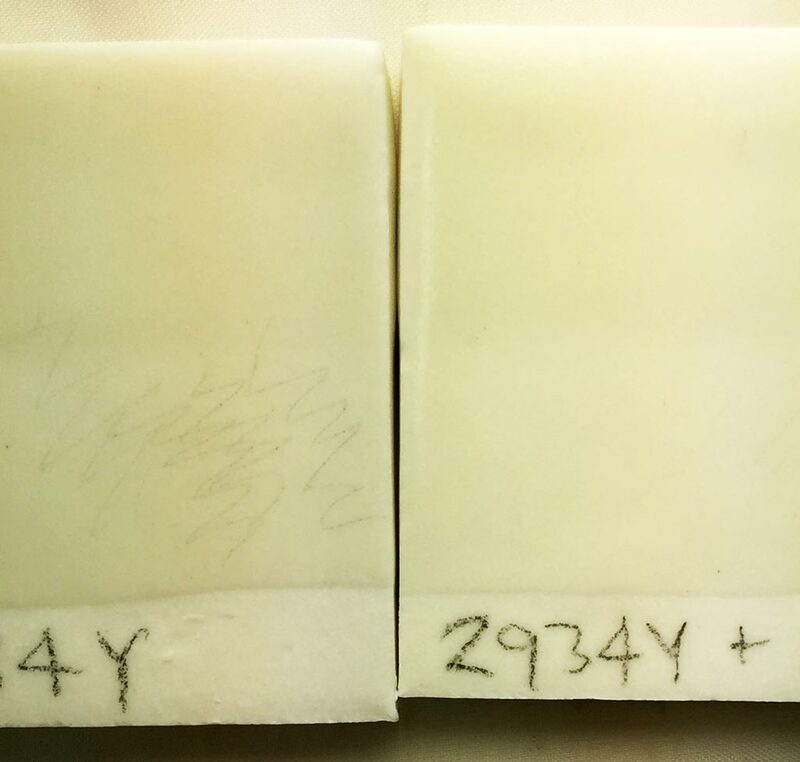 They compare the melt fluidity of G2934 (left) and G2934Y (right). The Y version sources its MgO from frit and talc (rather than dolomite). It is a much more fluid melt because the frit is yielding the oxides more readily. But Y has a key benefit: It has a much lower LOI, producing fewer entrained air bubbles and therefore fewer surface defects. And, even though it runs much more, it has the same matte surface! As long as it is applied at normal thickness, the extra melt fluidity does not cause any running. And it has another benefit: Less cutlery marking issues. It is actually a very durable and practical food surface glaze, having a low thermal expansion that fits almost any body. Although these appear glossy here, on ware they have the identical pleasant silky matte surface. This is the G2934Y matte base with overglaze decoration fired at cone 6. 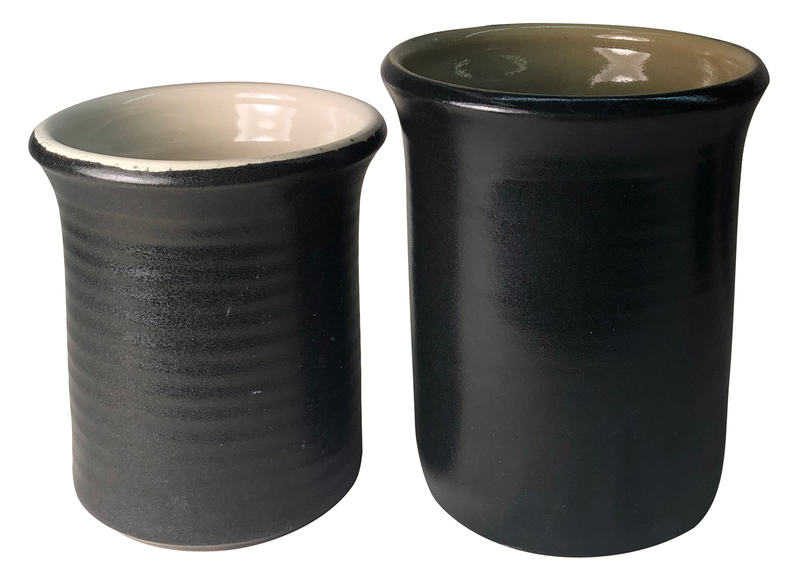 Although this matte has a high melt fluidity, overglaze decoration can be successful as long as it is not applied too thick and not overfired. But in this case the glaze is thickly applied. 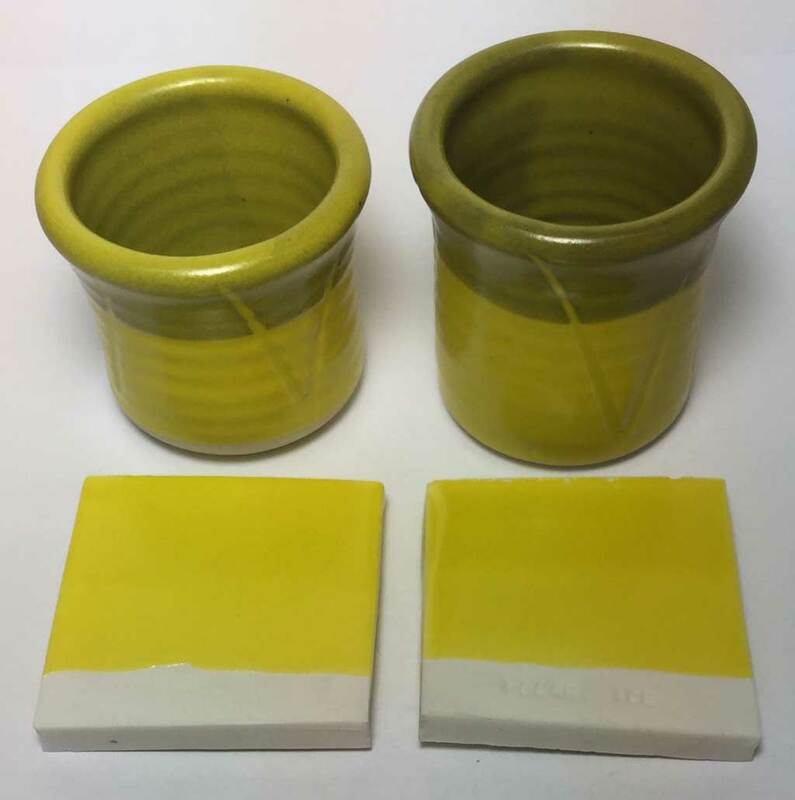 Once the critical thickness boundary is passed, the glaze's ability to hold overglaze in place quick degrades. 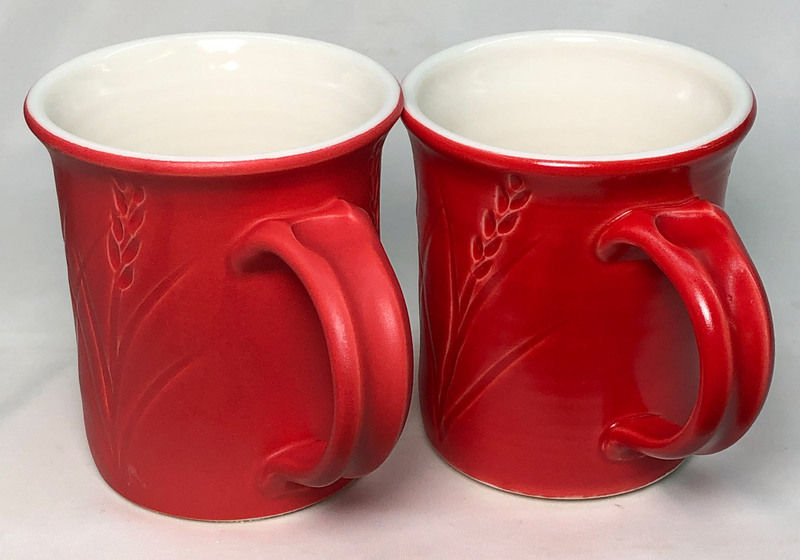 The G2934 recipe has less melt fluidity and fires to the same surface, it would would be a better choice as the base glaze in this case (and could be applied thicker). However this Y variation would be a good choice as the medium if you want to make your own overglaze brushable colors. Red stain in matte and glossy bases. Which looks best? The silky matte. 11% Mason 6021 encapsulated stain has been added to each. The one on the left is G2926B glossy base (it also has 2% zircopax as a fining agent for the micro-bubbles). But in the matte base on the right, G2934Y, no zircopax is necessary. It produces a stunning surface using this and other stains (including orange, yellow, black, purple), very pleasant to touch. 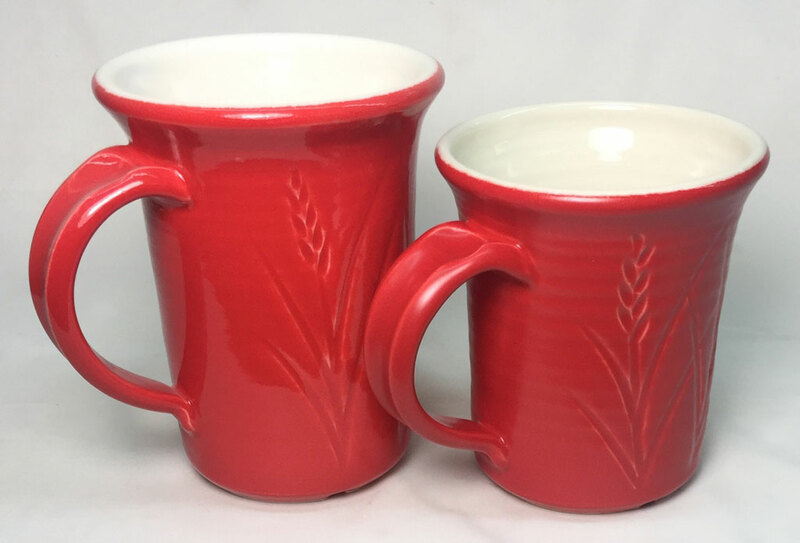 Mugs hand-built by Tony Hansen. This base glaze is an adjustment to the original G2934 matte. It employs a frit to source the MgO instead of dolomite. The result is a glaze that melts and flows very well, yet is matte. And it is a great host for a wide range of stains, they look better in this than in a glossy base. The only color that has not worked well so far is purple. Better to mix your own cover glazes for production? Yes. In this case the entire outside and inside of the mug need an evenly applied coat of glaze. In production, it would not make sense to attempt this by painting. For these reasons: Cost, quality, convenience. 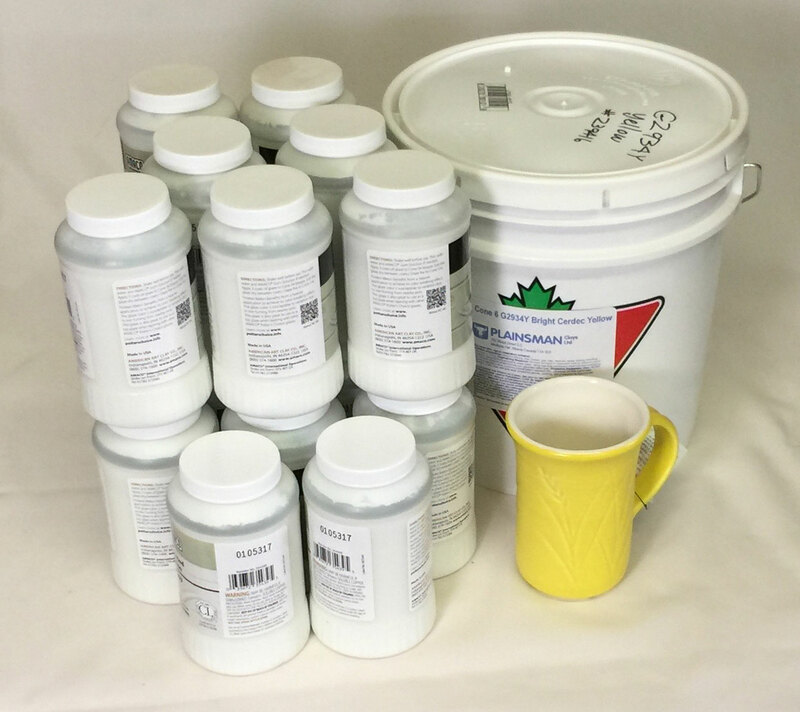 The right pail has 2 gallons of G2934Y base with 10% Cerdec yellow stain: $135. Cost of jars with the same amount: Almost $300! And you have to paint them on in three coats with drying in between. The one in the pail is a true dipping glaze (unlike dipping glazes sold by glaze manufacturers that dry slowly and drip-drip-drip just like brushing ones). This one dries immediately after dipping in a perfectly even layer (if mixed according to our instructions). And a bonus: This pail can be converted to brushing or base-layering versions using CMC gum. Although this is a whiteware body (Plainsman M370), under the transparent liner glaze (G2926B) the color appears ivory, off white. But with 8% added zircopax the quality of the color is transformed into a white that is even better than what a much more expensive New Zealand or Grolleg kaolin porcelain would exhibit with a transparent cover glaze. 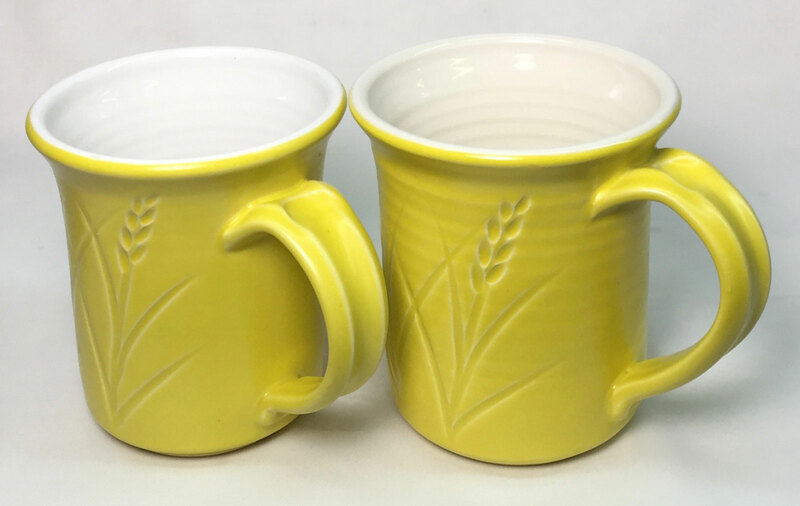 The outer glaze is G2934Y matte with yellow stain. The glazes were applied inside and outside by pouring and dipping (it would not be possible to apply the yellow evenly enough by brushing). A base MgO matte glaze recipe fires to a hard utilitarian surface and has very good working properties. Blend in the glossy if it is too matte.